Furthermore, I make mistakes in parenting like it's my job. Too bad no one will pay me for it. But let's get back to my favorite parenting book. And no, the book's publishers are not paying me to mention this book over and over (but maybe they should be paying me, because I mention it all the time). It's just that it's so practical and heart-directed without being reduced to behaviorist techniques and procedures. And it cuts to the chase without a ton of discussion about WHY it's important to train our kids with a heart orientation and biblical concepts. It assumes that we view that as important without theoretical rhetoric, which I appreciate because I wouldn't have bought the book without the foreknowledge that training my children from the inside out is important. Disclaimers aside, here's a nugget I gathered from the book that is changing our household, and it's something that I pray continually changes our hearts. I also hope that it can help you if you are struggling in the same areas in which we struggle. 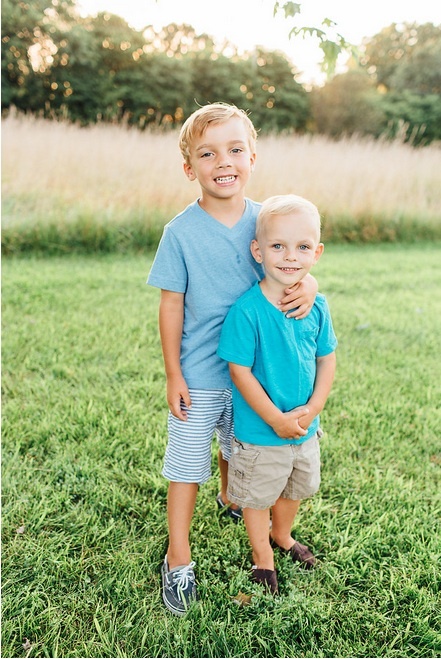 These boys are now old enough to have strong opinions, to have ideas about what they think we should do as a family or what they should do with their toys or who should be able to choose a movie before bedtime. Don't they look like angels, though? Photo by Ziegler Photography. Opinions get tricky. Brody might think they should play soccer with a ball, while Brecken thinks they should play basketball with the same ball (true scenario this morning). Fighting may ensue (also a true scenario from this morning). Internal temperatures my rise, blood may boil, and voice volume may rise (and that might not even include what the boys are experiencing). "Brody, can you try to think of a good plan to solve this problem?" We have had this discussion before, and if he is having trouble thinking of a few possible solutions, I can help him out with options we've previously brainstormed. BUT, he is getting better about coming up with possibilities on his own. Another possible question: "Brecken, are you thinking of what would make Brody happy in this situation, or are you only thinking of yourself?" I try to give time to answer, but I sometimes just dive right into the meat: "If you aren't considering others, you are being selfish. God tells us to value others above ourselves." Neither of the above questions are magic wands, spreading fairy dust on little gremlins to turn them into princes and automatically making everything dreamy. However, the questions DO make our boys think about their motives for doing things, and they DO introduce biblical terms into everyday scenarios that they can understand. The questioning approach doesn't ALWAYS work perfectly, but more often than not, it--at the very least--provides a better solution than the norm of screaming at one another (possibly yelling, hitting, and the most deplorable of all, biting). Lastly, it buys me some time. (What mom doesn't like the sound of that?) Instead of dealing with every little disagreement and tiffle that takes place in a 24-hour period (approximately 2,731 of these happen in our house daily), the ball is in their court most of the time, unless they just cannot figure it out and I have to intervene. They have tools to use to solve problems and work through disagreements on their own, and they have ways to view problems without exclusively thinking, "Me me me. Mine mine mine." And yes, that buys me some extra time in my daily life, which I definitely need now that there's a tiny human in the house who thinks she should be held 24/7. However, it also sets them up to be good brothers, thoughtful friends to others, considerate sons and students, and obedient followers of Christ. In fact, Brad and I are seeing the fruits of our efforts in helping them ask these questions. One of the best sights in the world is when your kids actually "get it" after you've talked and taught through concepts for a long time. Without an intervention, one of them might automatically (magically?) respond to a request for a toy with, "Brody, you can have this toy in two minutes."